Apple is within striking distance of a trillion dollar market value. The iPhone maker is currently worth about $935 billion, and the stock only needs to go up about 7% for it to top the mark. Apple (AAPL) wowed investors when it reported earnings Tuesday afternoon. Sales and profits topped forecasts, sending the stock up more than 3% in after hours trading. If it opens that much higher Tuesday, it will have a market value of more than $960 billion, moving it closer to becoming the first US company to cross the trillion dollar mark. That's a one with twelve zeroes. 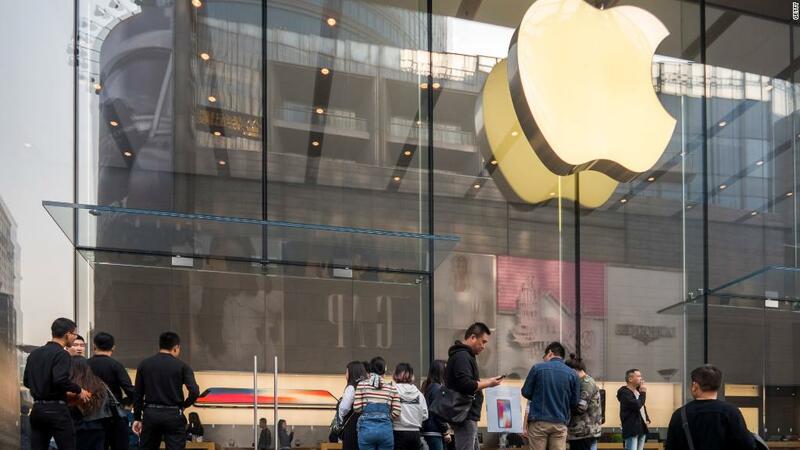 Some think Apple needs a new product to keep sales and profits booming, but the stock is up 12% this year thanks to solid sales of the iPhone 8 and X -- particularly in China and Japan. Surging services revenue from the App Store has also helped. Apple also has been using a nearly $245 billion stockpile of cash to boost its dividend and stock buyback program as a reward for investors, which now includes Warren Buffett. Apple isn't the only tech giant closing in on a trillion dollar mark though. Amazon (AMZN) is worth a little more than $870 billion. Google owner Alphabet (GOOGL) has a market valuation of nearly $845 billion. And Microsoft's (MSFT) market cap is now just under $815 billion. Wall Street has been speculating about which of these companies will hit the trillion dollar level first and how long it might be before all four of them are worth at least that much. Of course, there is no guarantee that any of them will reach the trillion dollar mark. Investors widely expected both Cisco (CSCO) and Microsoft to top a trillion dollar market cap in the late 1990s before the tech bubble burst in March 2000. Microsoft still has a realistic chance to get above a trillion, Cisco has a long way to go. Its market value is now about $200 billion. But if Apple, Microsoft, Google or Amazon eventually top the trillion dollar mark, none of them would be the first publicly traded company in the world to do so. Oil giant PetroChina (PTR) briefly surpassed a trillion dollar valuation in 2007 when its stock began trading in Shanghai, but shares quickly plunged. PetroChina, which is also listed on the New York Stock Exchange, is now worth about $220 billion.